Triceratops prorsus by Josef Moravec. Original oil painting 20" x 16" (51 cm x 41 cm). (Framed). TRICERATOPS prorsus was the most numerous of the horned cretaceous dinosaurs as well as the largest ceratopsian; it was one of the last to become extinct. Its name means "three horned face". Triceratops was a herbivore and its largest predator was Tyrannosaurus rex. It probably ate cycads and all other low-lying plants; it could chew them well with its cheek teeth. These animals probably lived in vast herds and hatched from eggs. They made up the bulk of the herbivore population just before the end of the Cretaceous period. Triceratops had a skull that reached up 6 ft (2m) in length with three protective horns and a great frill of bone that served for muscle attachment to the neck as well as protection from predators. Triceratops had one short horn above its beak and two long, double-recurved brow horns (up to 3 ft/90 cm long). The horns provided it with a very dangerous weapon and may have also been used in mating rivalry and rituals. Its head with large eyes was almost one-third as long as its body (up to 10 ft/3 m long) and was the largest ever possessed by a land animal. Its tough beak was toothless, but Triceratops had many cheek teeth and powerful jaws. It walked on all four, short and sturdy legs with hoof-like claws. Its body was bulky and it had a short tail. It also had a thick bumpy hide, prints of which have survived, to protect it against predator attacks, many of which could have come from the fearsome T-rex. Triceratops skulls are very common occurrences in the fossil record, in coastal lowland sediments, but skeletons are rare. Many specimens have bones damaged in combats with predators. Triceratops remains were first discovered in 1887 (Colorado, USA). TIME - 70 - 65MYA, Late Cretaceous period. Triceratops, Dinosaur Picture, 8.5" x 11"
Triceratops prorsus. Cretaceous period. Printed on premium glossy photo paper. Size 8.5" x 11" (21.5 cm x 28 cm). Original oil painting by Czech artist Josef Moravec. Triceratops, Art Picture, 13" x 19"
Triceratops prorsus. Printed on premium photo quality super "B" paper 13" x 19". Original oil painting by Josef Moravec. Triceratops art picture is printed on premium quality glossy photo paper. Note: Watermarks and Copyright markings do not appear on the final photo quality prints. 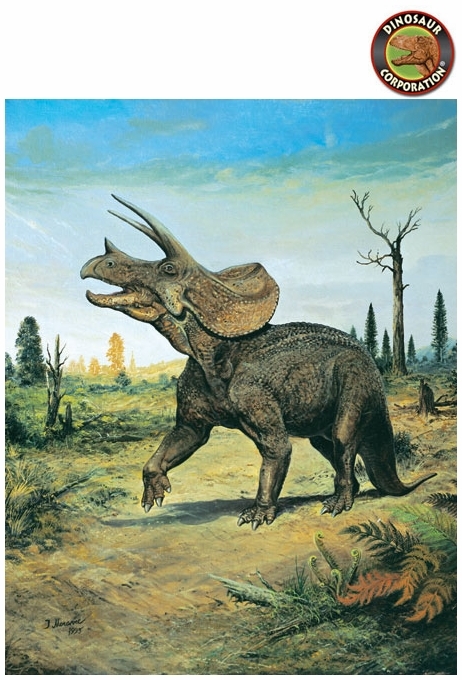 Triceratops prorsus, Dinosaur Picture, 11" x 14"
Triceratops from Cretaceous period. Dinosaur Art picture is printed on premium glossy photo paper. 11" x 14". Dinosaur Photograph, Triceratops prorsus, 16" x 20"
Triceratops from Cretaceous period. Triceratops dinosaur photograph is printed on high quality glossy photo paper. Triceratops Dinosaur Art, 20" x 24"
Triceratops prorsus in photographic quality reproduction Printed on high quality glossy paper. Original art by Czech artist Josef Moravec. Triceratops is framed in 17" x 14" wood frame, double matted in glass.